Organizing a vast collection of art with a new dynamic design. Established in 2001 with the mission to exhibit and promote prominent artists from North and South America concurrently, Pan American Art Projects provides a context for art dialogue between the various regions. They represent a strong roster of contemporary artists of the Americas and hold a collection of works by masters from Cuba, the Caribbean, Argentina, and the U.S. Their programming reflects these complementary arenas providing a comprehensive historical context to contemporary tendencies in the visual arts from these regions. In 2018, Pan American Art Projects consolidated their gallery and collection into one space. During this process, the existing website suffered a catastrophic hack that wiped out all the files and database. This could have been avoided by setting up and supporting the right digital architecture. Fulano was approached to help bring their website to the next level both visually and technologically. 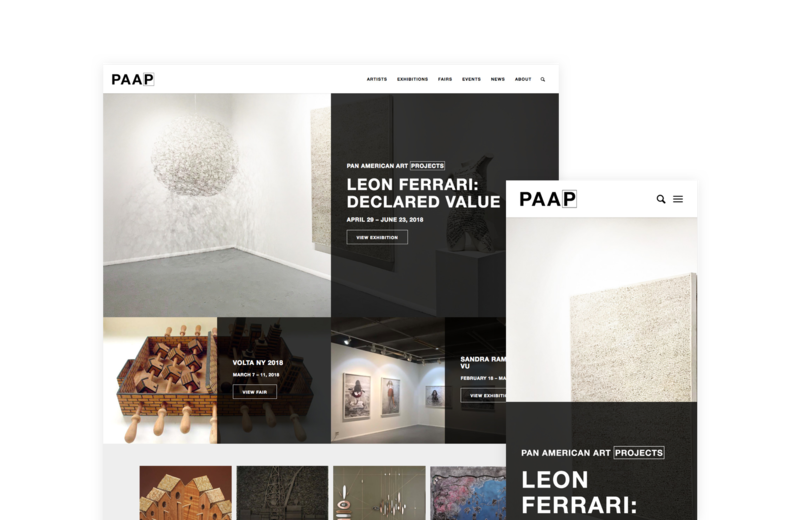 We worked closely with the Pan American Art Projects to craft a new digital presence that enhanced the gallery’s visual brand, could be easily expanded and was user-friendly to staff and users alike. We also carefully set them up within our digital architecture to ensure the best performing and most secure website environment for them to set up a new archive.